BEAUTY ADVICE WE CAN ALL USE!! I love when mainstream magazines feature plant-based and vegan products, recipes, lifestyles and ideas!!! Of course, selfishly, when I spot them, I voraciously eat it all up (sorry for the bad pun) because this is information I can actually use, but it’s also hopeful to see that veganism is growing and trickling out to everyone! Yay, number 2 is They have Vegan Tendencies! “Eating more dairy and meat (and sugar) is associated with having more wrinkled skin, but a diet rich in vegetables, legumes and olive oil has been linked to a youthful complexion. “Since some people have trouble absorbing all the nutrients in their food, a beauty-focused nutritional supplement can also help,” says Michelle Pagoda, New York facial plastic surgeon. 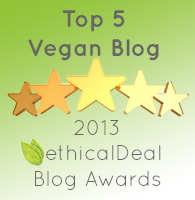 We are 100% in favor of having “vegan tendencies”—the more vegan you are, the better! Dark, leafy greens are known to be fabulous for the skin, bursting with nutrients that benefit your whole body. Take a look at our post Fight Off Wrinkles with Dark Leafy Greens and Recipes where we try to keep you deeply entrenches in “vegan tendencies” too! 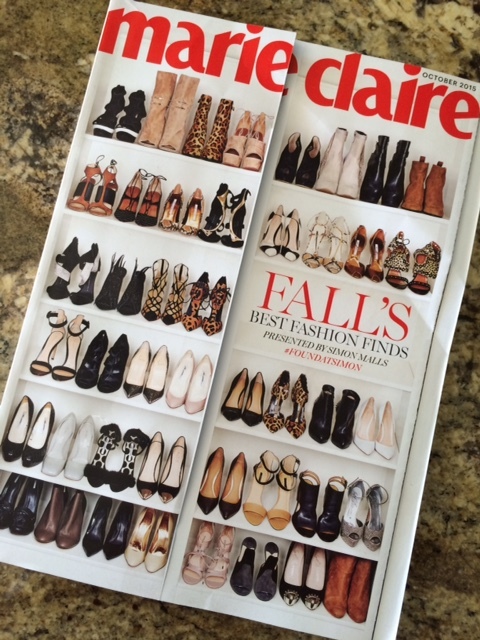 Marie Claire’s other 4 suggestions look very helpful, as well. 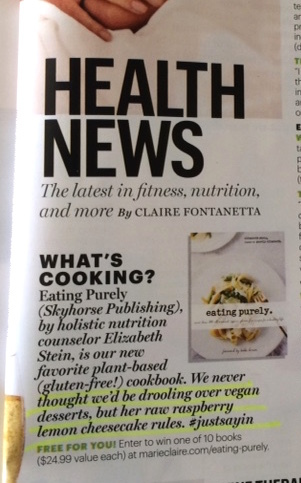 The next vegan sighting in the magazine is under Health News by Claire Fontanetta–a blurb about a new cookbook called Eating Purely by Elizabeth Stein. Fantastic! I’m ready to go out and get that book to add to my vegan cookbook collection, but if you want lots of plant-based recipes, of course, we have a solid array for you right here at Vegan American Princess! Kudos to Marie Claire for featuring a vegan cookbook! 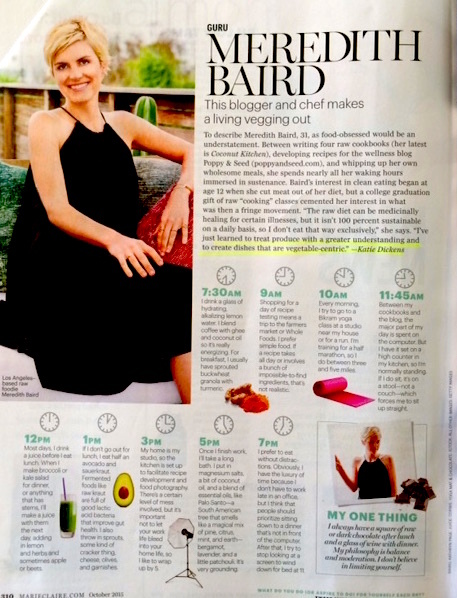 The third, very exciting entry in this edition of Marie Claire is the full-page coverage of Los Angeles-based blogger and raw chef, Meredith Baird. 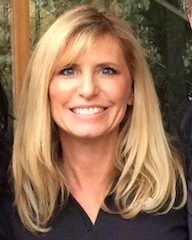 Eating cleanly and bringing in as many raw veggies into your diet is her part of her wisdom and the article clocks a full day in her life, as an example of how she goes about it. Hew new cookbook, Coconut Kitchen, and her wellness blog, Poppy & Seed, sound intriguing and I am definitely going to take a look at both! “I’ve just learned to treat produce with a greater understanding and to create dishes that are vegetable-centric,” says Meredith Baird. As we always say at Vegan American Princess, every little bit helps! 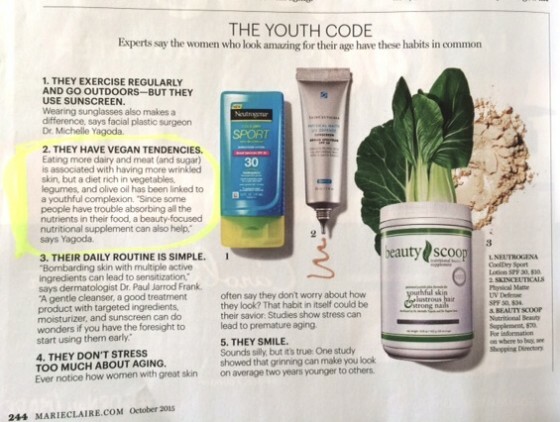 A few years ago, it would be difficult to find any articles about eating plant-based for health and beauty in mainstream magazines and now, they seem to be sprouting up all over! Love it!